Punta Cana consists mostly of beaches. 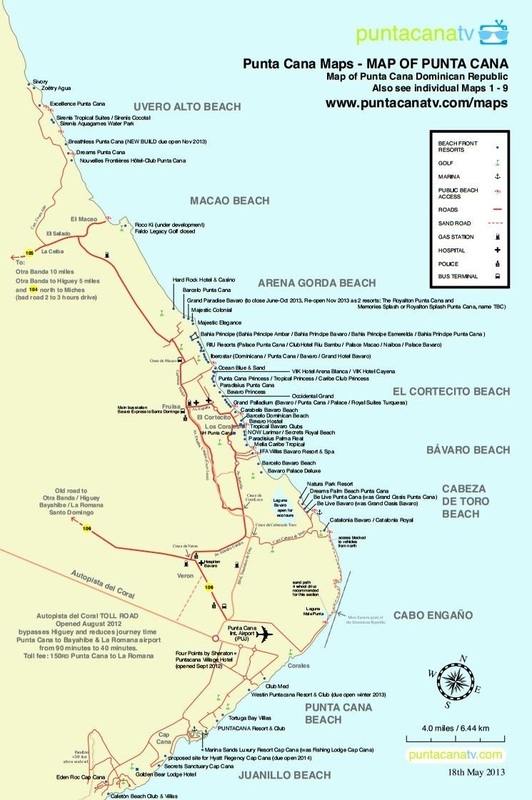 From south to north these are: Juanillo beach, Punta Cana beach, Cabo engaño, Cabeza de Toro beach, Bávaro beach, El Cortecito beach, Arena Gorda beach, Macao beach, Uvero Alto beach. The closest real town is Higuey about 45 minutes by taxi. Tourists arriving to Punta Cana will probably spend most of their vacation in and around their hotel. To visit other hotels, the simplest way is to take a stroll along the beach, or to take the beach taxi to El Cortecito or to the Cabeza de Toro area. There are many other options to get around in Punta Cana. Some of these are listed in other section of this guide.